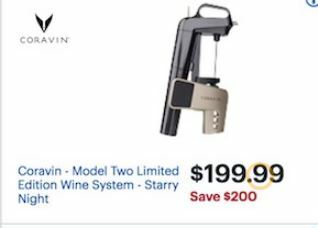 Find the best deals on the Coravin Wine System during Black Friday 2019. Funtober will collect and post all of the online deals and price discounts available in print ad sales between Thanksgiving Day and Cyber Monday 2019. Coravin is a wine preservation system that is designed to make the last glass just as amazing as the first. The wine system enables you to drink any wine, any time, without ever pulling the cork. Model Eleven – The first automatic and Bluetooth connected system. Model Two Elite: Also known as the Wine Journey, features high-end colors and chrome accents. We will be tracking here at Funtober all of the sales over the Thanksgiving weekend. Stop back on Wednesday or Thursday to see everything that we have found. Funtober will post all of the online sales on the wine preservation system available on the Monday after Thanksgiving. About Coravin: The company is privately held and located in Burlington, MA. The company is focused on transforming the way wine is served by providing the ability to enjoy wine sealed by a cork without removing it. It was founded by a medical device inventor with a passion for wine and technology.